life has felt a bit like a speeding train. As anyone who has ever done a move knows, it's not easy, especially when it's long distance. Throw in things like finding new doctors, settling into a new routine, dealing with student loans, getting a new car (you know, typical adult stuff that we all deal with) and I'm basically like I just can't with any other life things (like, uh, laundry and cooking). I'm so aware that I am so pathetically dramatic, but whatever. I firmly believe God created restaurants and take-out for a reason, and that reason is to save overly dramatic people like me from facing the realities of adulating. I'm only sort of kidding. In reality, we actually eat out more in LA than we ever did in New York (Leave it to us to never do what everyone else is doing! ), but we've also been relying a lot more on what we have deemed Trader Joe's dinner recipe hacks. In a nutshell, these dinner hacks are basically super simple recipes you can easily create with just a few ingredients all found at Trader Joe's (aka our second home...seriously, I swear some days I'm there more than at our actual home). Most of these recipes were created on the fly, but they're so delicious and so easy, that they continue to be repeat offenders in situations when we need dinner in a pinch, something that seems to have become the new norm in our house. This brussels sprouts flatbread recipe actually developed from a spinach mushroom flatbread that developed from having leftover Trader Joe's lavash bread (which is also great for wraps and breakfast burritos, fyi). Once we made one lavash flatbread and realized just how easy and yummy they were, we basically haven't stopped coming up with topping combinations since. Of course, it helps that Trader Joe's has so many great grab-and-go items. Things like prosciutto, asparagus, sun-dried tomatoes, artichokes, fresh tomatoes, olives, corn, olive tapenade, bruschetta, red pepper spread and grilled chicken strips are just a few of the things that come to mind that work for toppings. While I love the spinach mushroom one, this brussels sprout, walnut and goat cheese is even more of a favorite. It's super light and healthy, pairs well with a simple side salad (and wine! ), and would even make a great lunch option, too. Since I know we all have busy lives and most of us are Trader Joe's shoppers/fans, I wanted to start sharing these TJ's dinner recipe hacks, because if they're making our dinnertime a 100x easier, I know they can do the same for you. So be on the lookout for these to start popping up in the "EATS" section. 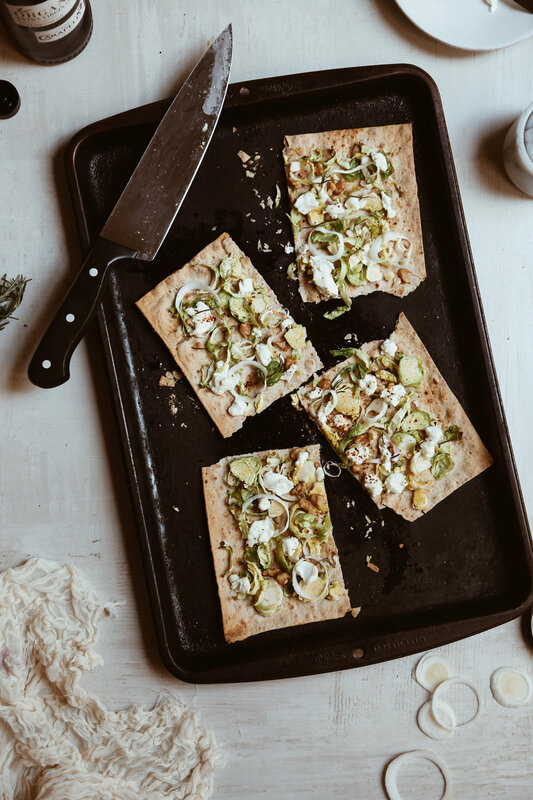 In the meantime, you're only 15 minutes and a quick Trader Joe's trip away from enjoying some brussels sprouts flatbread! I'd love to know, do you have any Trader Joe's hack recipes or tips? Spill in the comments! Place one lavash bread on a baking sheet. Drizzle generously with olive oil, then layer on the brussels sprouts, onions, a sprinkling of walnuts, lots of goat cheese crumbled across the top, plenty of rosemary and a little salt and red pepper flakes. Bake for 8-10 minutes, or just until the edges start to turn golden brown. Remove from the oven, slice into 4 pieces and serve (goes well with wine, relaxing and reading ;D). Measurements given are all suggestions and can easily be increased, decreased or swapped out for other ingredients.